If you're part Irish, you have someone in your background to thank for it. 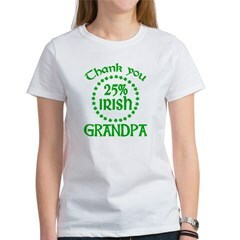 Here's a cute design for 25% Irish - Thank You Grandpa! Great for anyone with an Irish grandfather & 25% Irish background. If you're part Irish, you have someone in your background to thank for it. 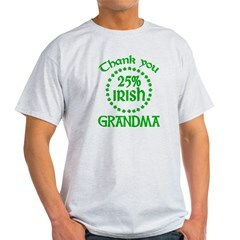 Here's a cute design for 25% Irish - Thank You Grandma! 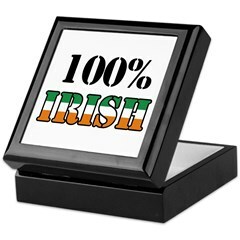 Great for anyone with an Irish grandmother that wants to proudly proclaim their Irish heritage. If you're half Irish, you have your parents to thank for it. Here's a cute design for 50% Irish - Thank You Mom! 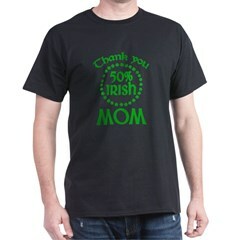 Great for anyone with an Irish mother that wants to proudly proclaim their Irish heritage. If you're half Irish, you have your parents to thank for it. 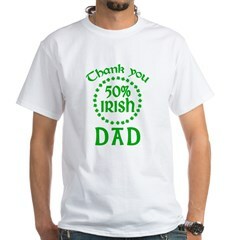 Here's a cute design for 50% Irish - Thank You Dad! Great for anyone with an Irish father that wants to proudly proclaim their Irish heritage. On St. Patrick's Day, anyone can feel 100 Percent Irish! Fun design comes on t-shirts, mugs, hats, buttons and more. Great for office parties! 100% Irish in stencil letters with Irish in the colors of the flag of Ireland. Are you 100 percent Irish? then show the work with this design on any of our great t-shirts, hoodies, or apparel.